Last May, the Battersea Power Station developers opened what they announced as a Pop-Up Park, that would receive visitors from all over the world every weekend and host several events. The so called public park, that was even added to Google Maps, ( how did that happen?) soon ‘popped off’ and in late September closed its doors. The Power Station is one of the few obstacles preventing walkers from strolling along the south side of the Thames Path. 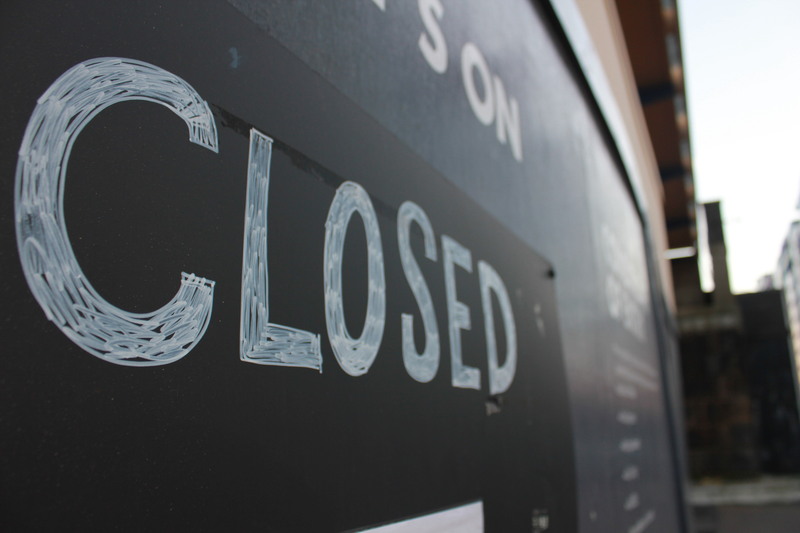 For years this path has been blocked– a fading sign claimed it was a “construction site” even though really it was a very agreeable and exclusive river front office for construction company Berkeley Homes. The Berkeley Group (Berkeley, St James, St George, St Edward ) are responsible for ”delivering” many of the ugly and soulless developments despoiling the south bank. 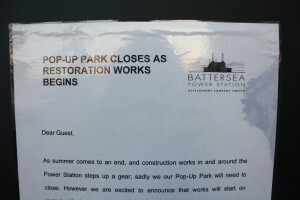 In a new sign hanging on the now closed door, the developers claim the reason why they are shutting access to the park is related to the beginning of restoration works of the Power Station. In fact phase 1, which has barely started, is the building of monstrous flats in the slither of land along the rail track, forever obscuring the wonderful views from the west. “Restoration” (or desecration depending on your view of art deco architecture) of the power station is phase 2. The sign also states that they have had “a great time hosting over 55,000 guests” in the pop up park. Are they are including in that number the more than 30,000 people that visited the building during the London Open House weekend? 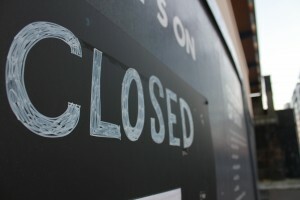 If so the pop up park was already closed then. Or do they count those attending the numerous events they have hosted, regardless of the alleged danger of the chimneys falling, on the south side of the site? Finally it suggests you write to zkelly@bpsdc.co.uk if you would like to discuss putting on an event- It would seem danger from the chimneys only affects the non-paying public but not private, paying guests. Perhaps “PR Park” would be a more appropriate name than “pop-up Park”. This entry was posted in Battersea Power Station and tagged Architects' Journal, Battersea Power Station, Battersea Power Station Community Group, Berkeley, bio fuel power station, bio fuels, Black Redstarts, cameron, chimneys, danger, David Cameron, deforestation, demolishing, demonstration, design, english heritage, Environment, extinction, funds, heritage, iconic, Light Pollution, London Open House, London's most Influential People, lottery, master plan, Media, media attention, newspapers, Noise Pollution, Open house London, Orang u Tan, palm oil, Peregrine Falcons, planning permission, polluting, pollution, Protected Species, Real Estate Opportunities, Red Bull, Red Bull X Fighters Event 2010, Regeneration, REO, Rob Tincknell, Sime Darby, St Edward, St George, St James, Steven Goldsmith, the Local Guardian, The Power 1000, The Times, Tooting Constituency, Treasury Holdings, Viñoly masterplan, wandsworth borough council, wandsworth council, Wandsworth Green Party, WMF, world herritage, World Monuments Fund by Neus Costa Ventura. Bookmark the permalink.